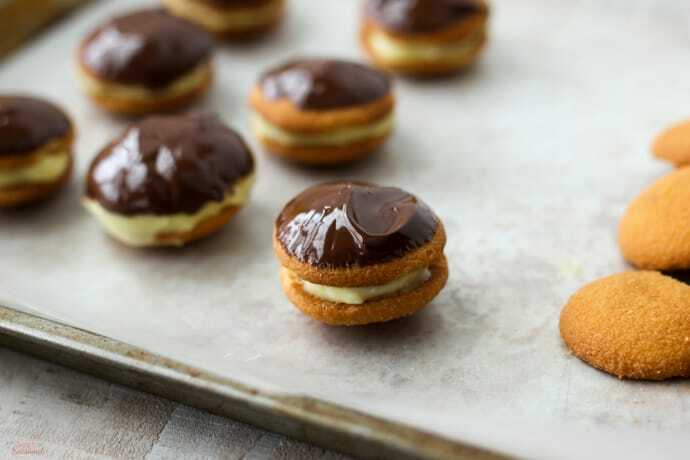 Bring these no bake Easy Eclair Cookies to your next summer party. 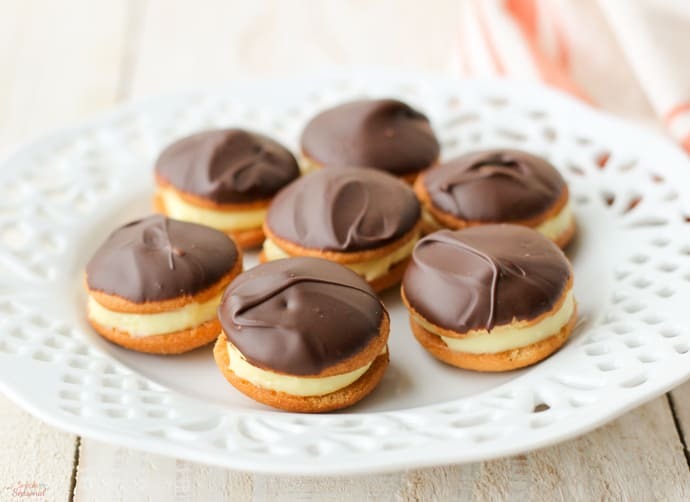 Creamy filling and rich chocolate topping makes them the perfect bite-sized treat! Dessert. How do I love thee? Let me count the ways…chocolate, pudding, caramel, ice cream, cookies, cake, cupcakes. I could write poetry to dessert. Really bad poetry, but still. 🙂 However, in the summer, I do everything I can to avoid running the oven and heating up the house. That’s where these Easy Eclair Cookies come in! I love a good no bake recipe, especially when it includes chocolate! 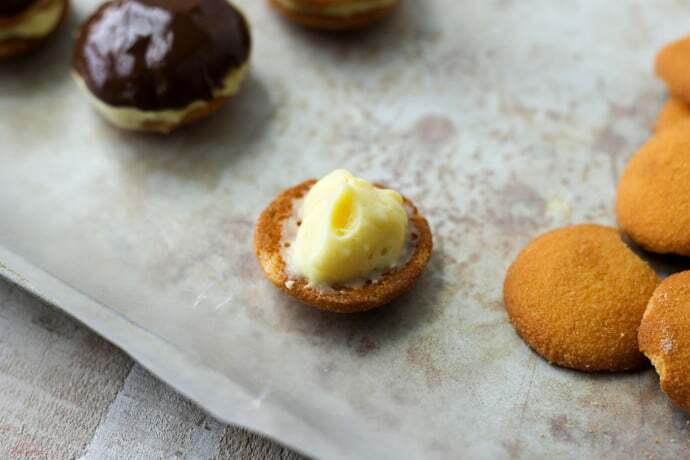 To the purists: I am fully aware that these are not actually eclairs. These are simply my American “busy mom” version of the classic pastry. 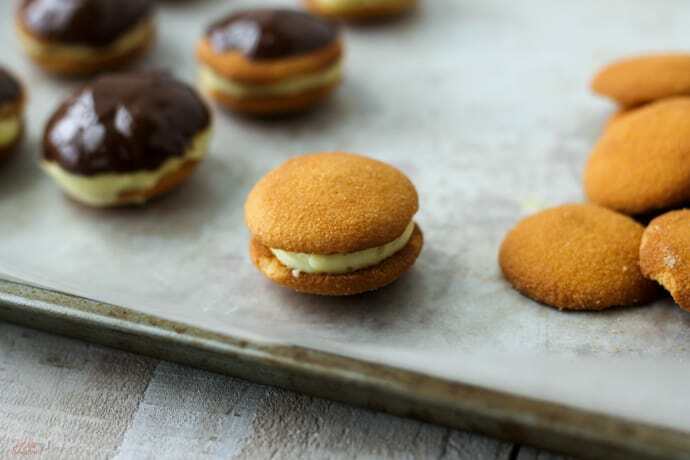 🙂 The flavors are similar with a creamy filling, chocolate topping and built with classic NILLA Wafers. The best part is this is a no bake recipe that’s perfect for summer! I’ll do anything to avoid using my oven during the long summer months, so treats like this are perfect for bringing to our family parties all summer long. 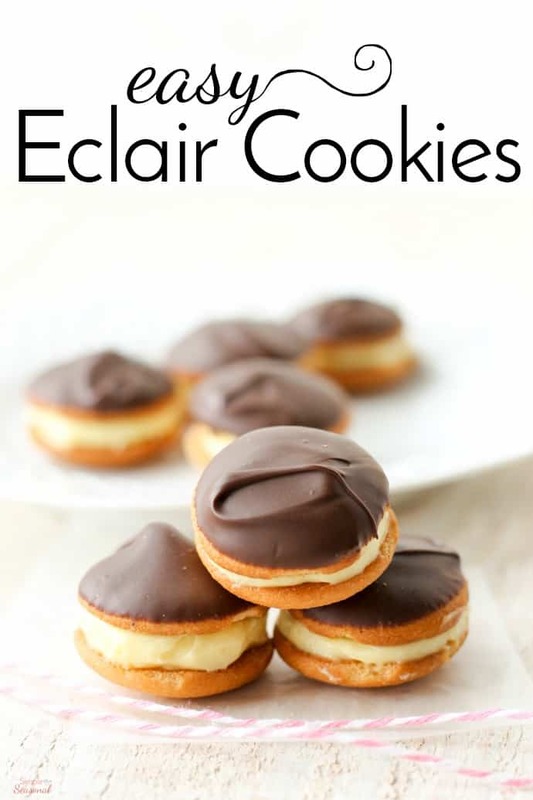 I made these Easy Eclair Cookies for our Memorial Day BBQ and they were a perfect sweet snack for the day. The next step is to dip the top in chocolate. The trick here is to only hold onto the bottom NILLA Wafer. That will keep your fingers out of the chocolate and keeps the whole cookie clean. Gently scrape the excess chocolate off using the side of the bowl. The last step is just to chill until the chocolate is set. 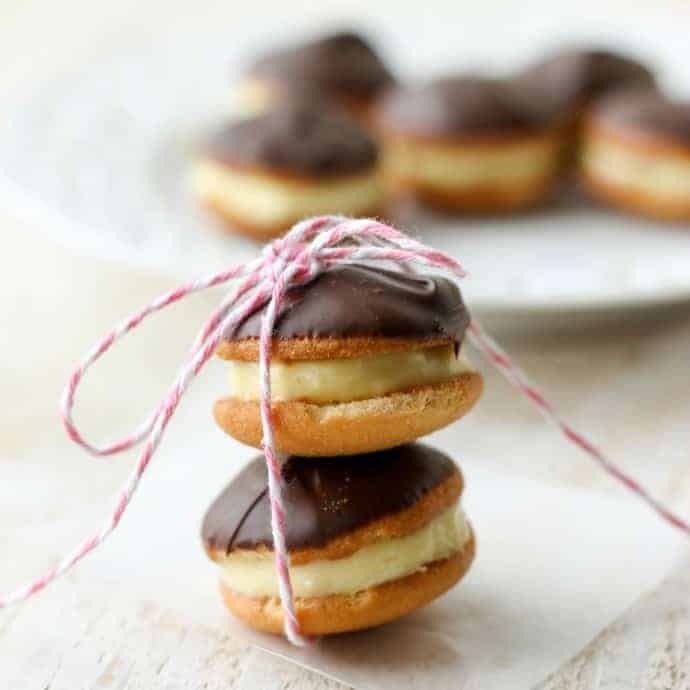 You can two different things with these Easy Eclair Cookies: chill in the refrigerator and serve the same day OR put them in the freezer and serve later! 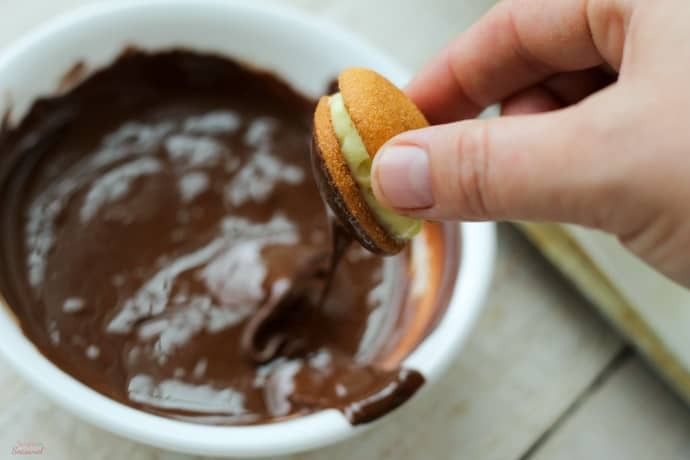 Once you chill them to help set the filling and chocolate, they are fine to be served at room temperature. If you’ve frozen them, you want to eat them within a few hours of removing from the freezer, as they start to soften and can get a little messy. They taste great straight from the freezer, too. My kids compared them to an ice cream sandwich. In a small bowl, beat the cream cheese with an electric mixer until smooth. Set aside. In another bowl, whisk together the pudding mix and milk. Then add the cream cheese and mix with the whisk or mixer until well combined and smooth. Place in the refrigerator for a few minutes to chill and set. Spoon 1-2 tsps of pudding mixture onto the flat side of a NILLA wafer. Cover it with another one and press down gently to form a sandwich. If the mixture feels a bit soft still, place the cookies in the freezer for 10 minutes. In a small bowl, combine the chocolate chips and vegetable oil. Microwave for 30 second intervals, stirring well each time. Keep melting and stirring until the chocolate is smooth and shiny. 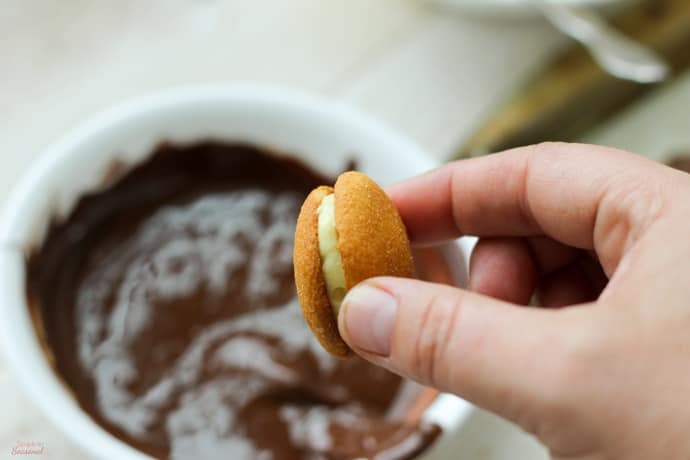 Holding the sandwiches by the bottom cookie only, dip the tops in the chocolate. 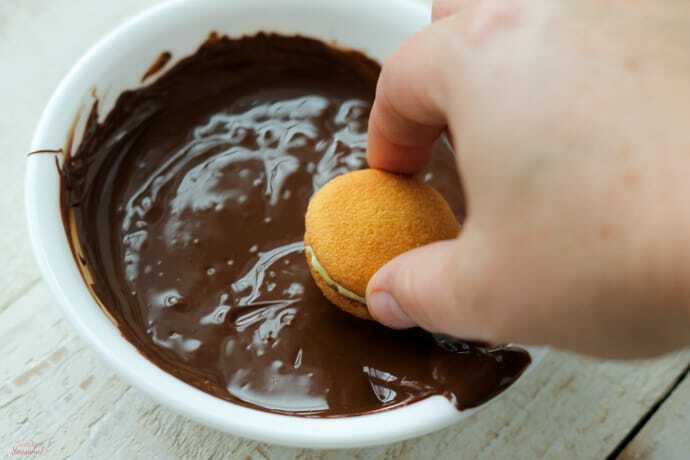 Allow the chocolate to drip off, and then gently scrape along the side of the bowl to remove any excess. Refrigerate once more to set. Once set, serve at room temperature or freeze for later use. Using cream cheese in the mixture help keep the filling from getting too mushy, especially at room temperature. It also gives it a rich flavor! If frozen, allow to thaw for 15-20 minutes at room temperature to soften a bit. However, these do taste great frozen! 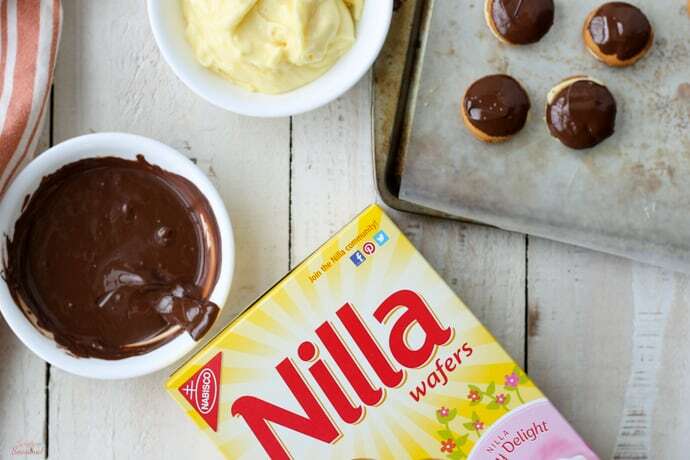 Click here for more great NILLA Wafers recipes to try this summer! You can get both classic NILLA Wafers and new Lemon NILLA Wafers at Walmart. I used the Lemon NILLA Wafers in my Pineapple Pie and the flavor combination was perfect! It’s another refreshing no bake recipe for summer. These are so adorable! I bet they’re delicious! What a great idea–thank you for sharing! Wow that’s such a cute idea!! So simple and so cute. I can’t wait to try these!! Mmmmmmmmm! Those look absolutely decadent!